The sepia-toned landscape suggested a movie nostalgic for an earlier time. Or, more likely, for the as yet unfilled promise of spring. 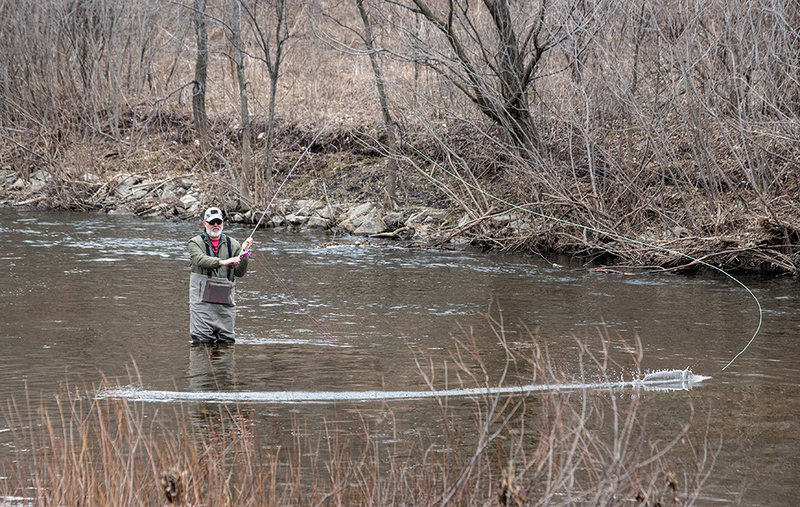 Hopeful, cabin-bound Wisconsinites flocked to the outdoors on the first official weekend of the season. Saturday had brilliant equinoctial sunlight. But even on a far gloomier, overcast Sunday that threatened rain, plenty of folks were out and about as I walked through Hoyt Park on my way to see what was happening in Sanctuary Woods. 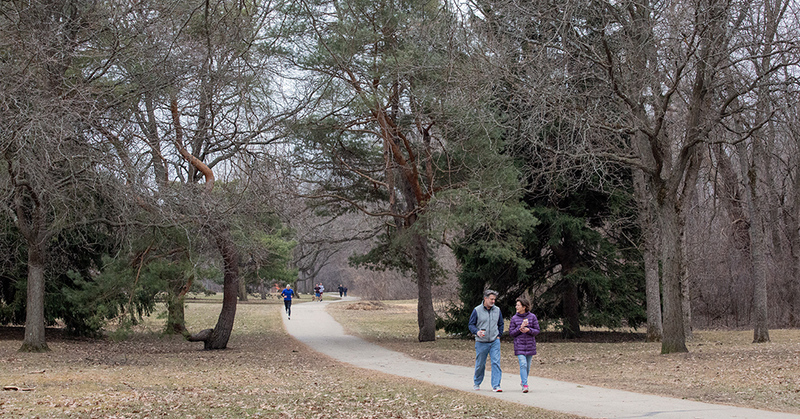 A steady stream of joggers, cyclists and walkers flowed down the Oak Leaf Trail. 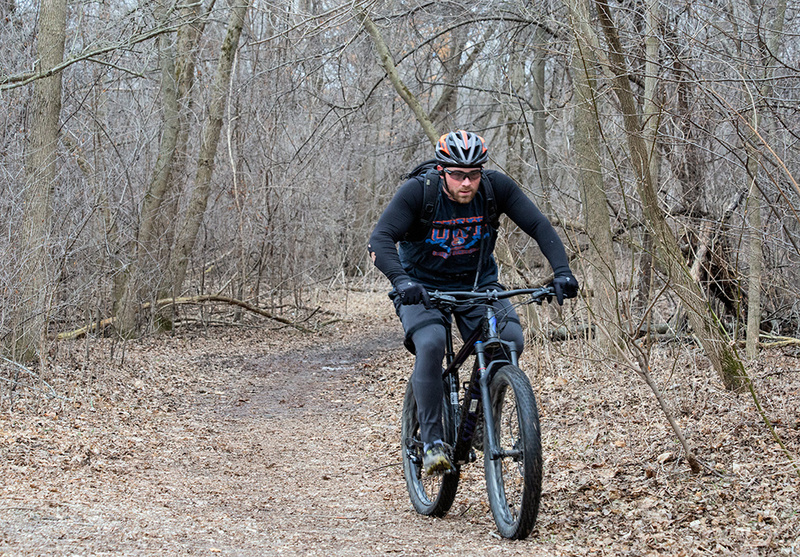 Mountain bikers sped through the woodland along the river on the Hoyt Mountain Bike Trail. I even found a fisherman casting away out in mid-stream. Nothing biting so far, he told me. The day wasn’t exactly warm, but it had shed the bone-chilling refrigeration of the past few months, a relief for everyone and the reason so many were out. 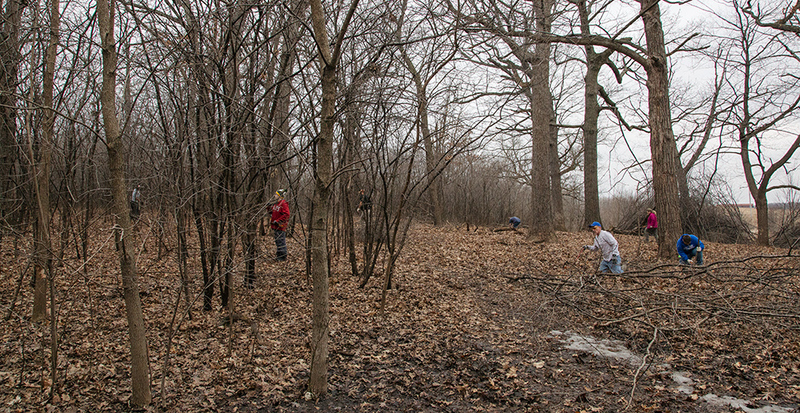 The fact that the trees hadn’t started to bud also made it the perfect time to tackle a buckthorn infestation. 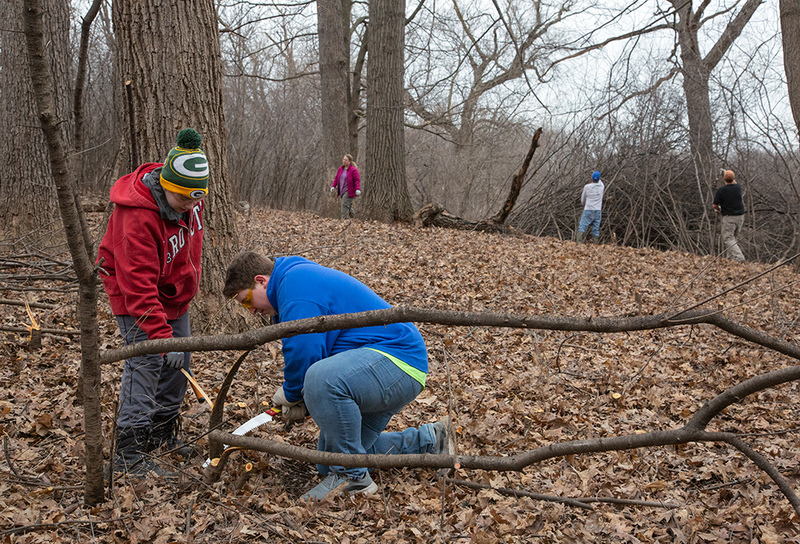 I caught up with a small brigade of do-gooders after they had cleared a tiny corner of the historic Insane Asylum grounds, now known as Sanctuary Woods. For the uninitiated, 66-acre Sanctuary Woods is an as yet unprotected corner of the Milwaukee County Grounds, contiguous with the protected County Grounds Park. 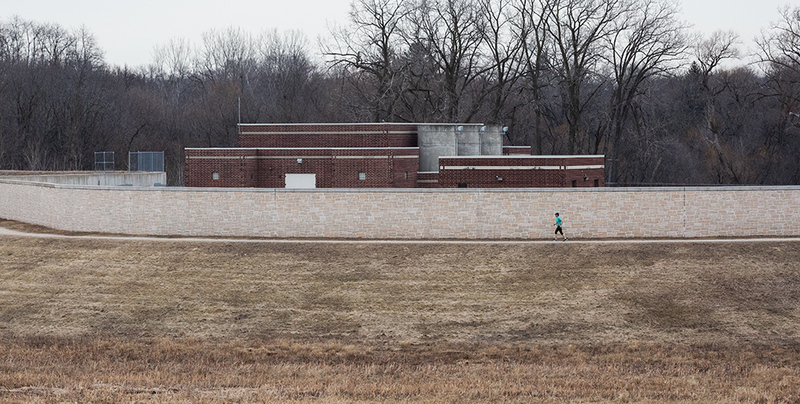 The county-owned parcel of land became a cause célèbre in 2017 when the City of Wauwatosa unveiled its proposed Life Sciences District Master Plan, which then included high-density residential development of large portions of Sanctuary Woods. Long story short, turns out everyone loves the woods and community-wide efforts to save it have led the city to revise its Master Plan. Efforts to provide permanent protection continue. 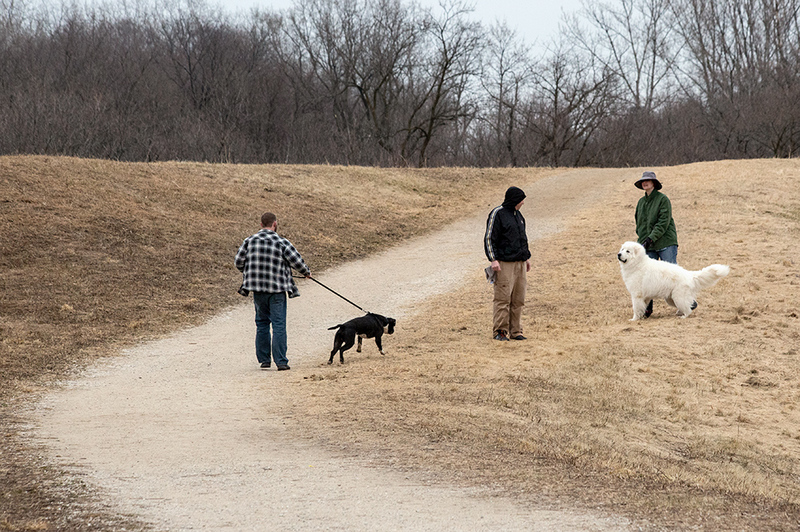 For many years, Sanctuary Woods has been a popular destination for birders, dog-walkers and nature-lovers. But those, like me, who have visited often over the years have also seen significant changes, including the ever-thickening encroachment of buckthorn, a particularly aggressive invasive species. I was delighted to learn that a plucky band of boy scouts and their leaders were finally taking up the task of eradication. Buckthorn brigade. Back: Katlyn P, Christina P, Mike M, Scott K, Jonathan P. Front: Jack G, James M, Mark M, Jason O. Common buckthorn (Rhamnus cathartica) was intentionally introduced to the US when it was planted as a hedge in urban settings. (Full disclosure: I have a buckthorn hedge around my patio at home. I have to constantly trim it back!) Unfortunately, buckthorn has spread into natural areas where it easily out competes native plants for several reasons. Buckthorn leafs out early, thus shading native wildflowers and shrubs. It even emits a chemical compound into the soil that prevents other seeds from germinating. The crew busily cut the trunks with clippers and saws, leaving them a few inches high so that they could be located for the necessary next step: spot treatment with herbicide. 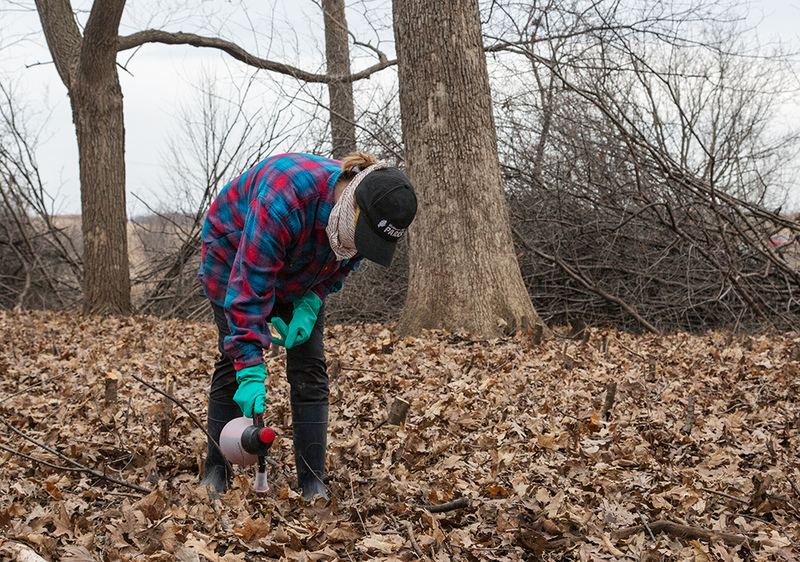 This step was undertaken by Katlyn Pluer (right), a restoration ecologist with the Milwaukee County Parks Department who has been trained and holds a state pesticide applicator license. According to Parks Department Natural Areas staff, the herbicide used on Sunday is designed to target the root system of the woody invasive species that exist in natural areas. This method (cut stump treatment) is very precise. Hand sprayers with drift cones on the nozzle are used to prevent non-targeted application, and the smallest amount of herbicide necessary is used. A cautionary note: don’t simply cut down buckthorn! If herbicide is not applied to the cut stumps, new growth would almost immediately begin to sprout from the roots and actually accelerate the spread of the buckthorn. 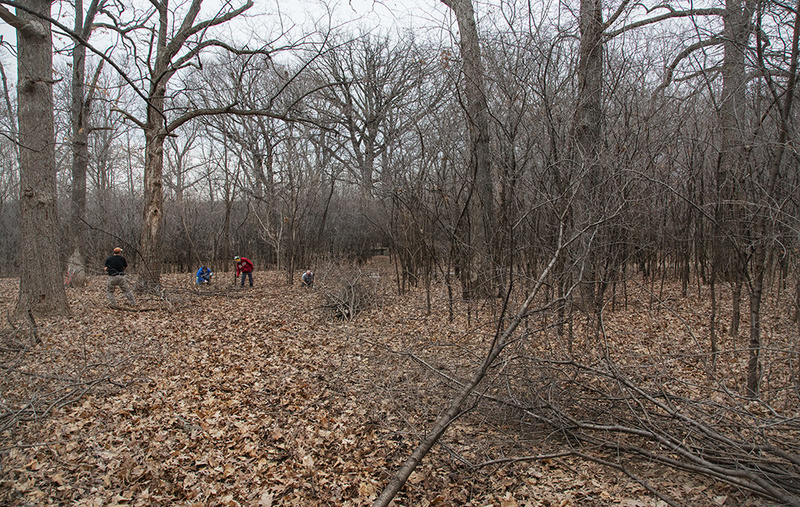 The spread of buckthorn in Sanctuary Woods has created an invasive monoculture in the understory and has changed the ecological structure of the site from oak savanna to degraded woodland. The first stage in land restoration is invasive species control and removal. Once this is complete, native plants can be reestablished with the intention to restore the full ecology of the site. 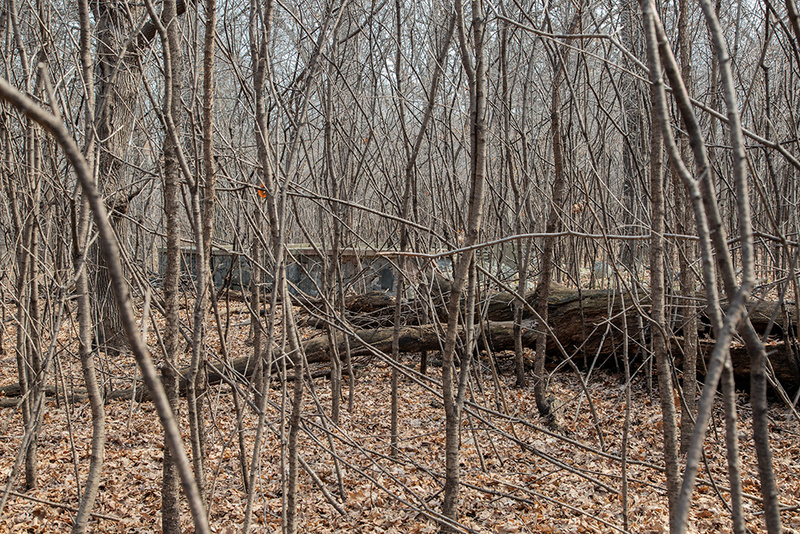 Some of the historic architectural remains of the asylum grounds have been overgrown and obscured by the dense infestation of buckthorn. 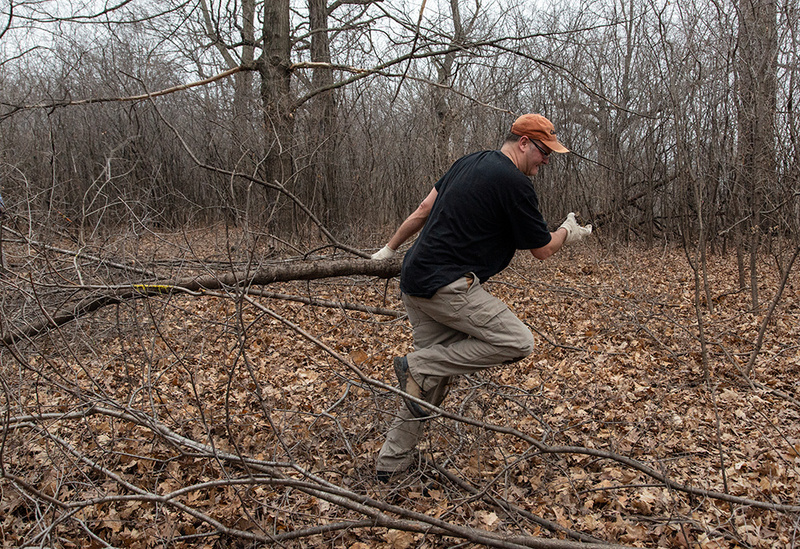 The cut buckthorn is stacked in huge brush piles on site that will serve as habitat for wildlife. 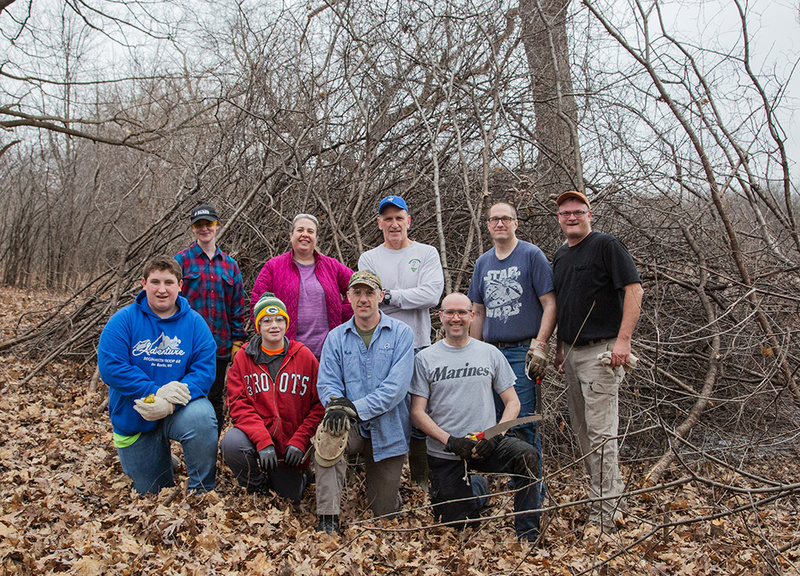 Sunday’s work crew was organized by local amateur historian Jonathan Piel (above), who has created a useful, interactive mapping website to educate the public about the historical significance of Sanctuary Woods. Additional work days are planned. It’s a big task! The crew was able to clear and treat about half an acre, with several acres to go. 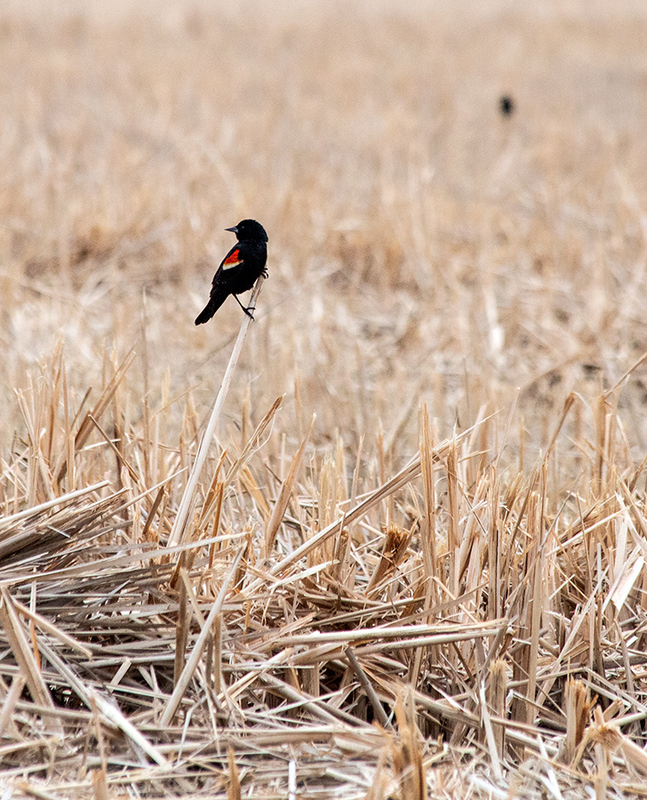 Walking back, I took note of the many redwing blackbirds staking out territories on the cattail stubble in the recently mown flood detention basins—another method for controlling invasive species. 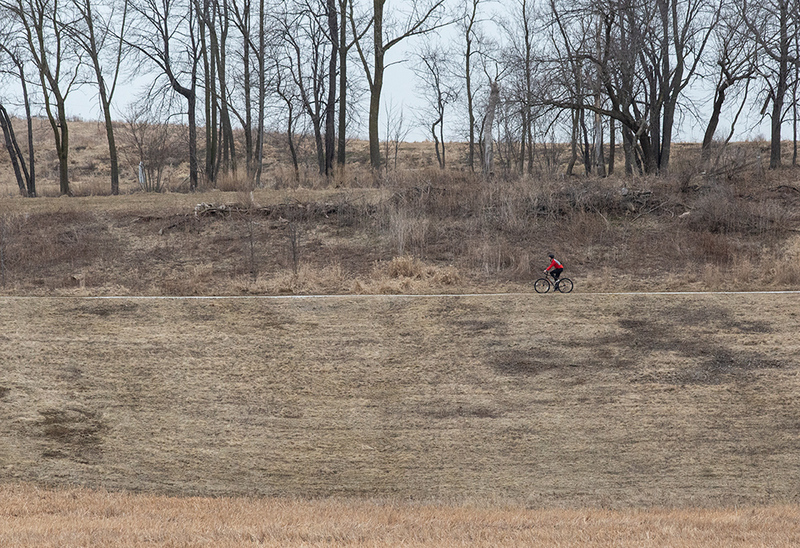 Along with all the active people enjoying the gloomy day, they were the clearest harbinger of spring! 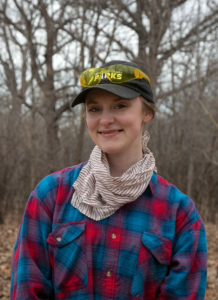 Eddee Daniel is a board member of Preserve Our Parks and project director of A Wealth of Nature.